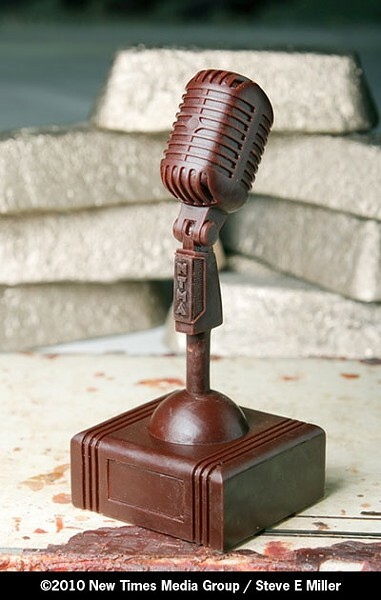 JUST ADD BRONZE : The wax version of this year’s New Times Music Award awaits casting at Genesis Bronze. The deadline for submissions is Monday, June 21, at 5 p.m., so hurry! There’s still time to enter the New Times Music Awards, and because of the six genres to enter, there’ll be more winners this year than ever before. First place winners will receive prizes and custom-made bronze awards, not to mention bragging rights for a year! Enter yourself or your band, combo, or ensemble under the following categories: classical/jazz, rock/alternative, hip-hop/rap/electronic/DJ, folk/bluegrass/Americana, blues/R&B, and reggae/worldbeat. You can enter up to three songs in each category, and if you’re diverse enough, enter in all six categories! Entries will be judged on musicianship, songwriting, recording quality, and overall sound by a panel of three industry experts, who’ll award first through third prizes—18 in all. There’s also a separate songwriting contest with its own panel of judges—three published songwriters—who’ll judge your song based on melody, lyrics (you must submit lyrics with your entry), and overall sound. Again, first through third will be awarded, bringing the running total of winners to 21! You can enter a song in both the writing contest and one of the genres, meaning one song can potentially win more than one prize. All the judging is done blindly. The judges receive burned CDs of all the entries, with song titles but no artists’ names listed. Finally, we’re also doing an Album of the Year Award, which is free to enter (24 awards!). The CD must have been recorded between June 21, 2009 and June 21, 2010. Find a copy of the entry form on page 2 of this issue, or go online to newtimesslo.com. The deadline for submissions is Monday, June 21. The awards will be presented during a four-day music festival, running Thursday, Aug. 19 through Sunday, Aug. 22, including a free all-day fest on Saturday, Aug. 21 in Mission Plaza. You can’t win if you don’t enter! In fact, if you entered last year and didn’t win, you can even re-enter the same material. Remember, this year we’re handing out 24 New Times Music Awards, and one of them could have your name on it. The contest is open to bands with at least one member living in SLO or northern Santa Barbara County. By the way, Soundcheck—the Central Coast’s only all-inclusive music resource—is coming out again in August, and we’re working on updating our listings. If you didn’t make last year’s issue, send your info (band/artist name, genre(s), contact name and phone number/email, URL if you have it, and a brief (50 words or fewer) description of your band to soundcheck@newtimesslo.com. You can also submit a high-resolution photo (at least 4 by 6”, 200 dpi) for possible inclusion. If you’re a music-related business, music teacher, promoter, record label, venue, club, festival, etc., we want your info, too. This year Soundcheck will also include artists and businesses from northern Santa Barbara County. 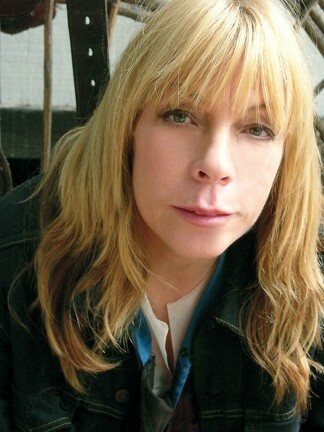 CHUCK E’S STILL IN LOVE : Rickie Lee Jones is one of the headliners at this weekend’s Live Oak Music Festival, June 18-20, and camping and day passes are still available, but hurry! Come on, campers! Get with the program! The Live Oak Music Festival is this weekend, so quit your lollygagging and buy your tickets now! This 22nd Annual three-day show happens June 18 through June 20, and it’s the biggest fundraising event of the year that benefits Public Radio KCBX. Visit liveoakfest.org to see the whole line-up, but trust me, there’ll be more hot bands down there than you can shake a tambourine at! You can get weekend camping passes and hang the whole time, or by day passes and see the likes of the Chicago Blues Reunion on Friday, The Dynamites on Saturday, or Rickie Lee Jones on Sunday. You’ll also hear a lot of emerging talent such as Sallie Ford and the Sound Outside, Red Skunk Jipzee Swing Band, Sparrow’s Gate, and Jade Jackson. Visit the website or order by phone at 781-3030. Full Festival Camping Tickets are $115 (adults); $75 (teens); $35 (children). Vehicle parking passes are required. MAGIC FINGERS : Self-taught guitarist Andy McKee brings his percussive sound to Downtown Brew on June 18. Did you see August Rush? You know, the movie about the orphaned musical prodigy (Freddie Highmore) who gets exploited by a Fagin-like character (Robin Williams) on the streets of New York, where he’s made to busk for tips, all-the-while searching for his real parents? Well, do you remember that awesome, percussive guitar sound the August Rush character played? Andy McKee makes August Rush sound like John “Bluto” Blutarsky smashing that folksinger’s guitar against the wall in Animal House. This Friday, June 18, Downtown Brew hosts this groundbreaking guitarist (7:30 p.m.; all ages; $16 presale or $18 at the door), and he’s guaranteed to blow you away. Check him out on YouTube, where his clips have garnered more than 78 million plays! Self-taught, McKee gained international attention when he became one of the top finalists at the prestigious National Finger Style Guitar Championships. Since 2001, he’s released five albums independently selling upwards of 40,000 copies, and he now plays about 200 shows a year. Downtown Brew keeps the music galloping along on Wednesday, June 23, when country star Mark Chesnutt plays an intimate show in the club (7 p.m.; 21-and-older; $28 presale or $30 at the door). It’s difficult to fathom seeing a star of this caliber in so small a club. Chestutt’s had 14 No. 1 hits, 23 top ten singles, four platinum albums, and five gold records! This guy’s a honkytonker of the first order. presale or $20 at the door). 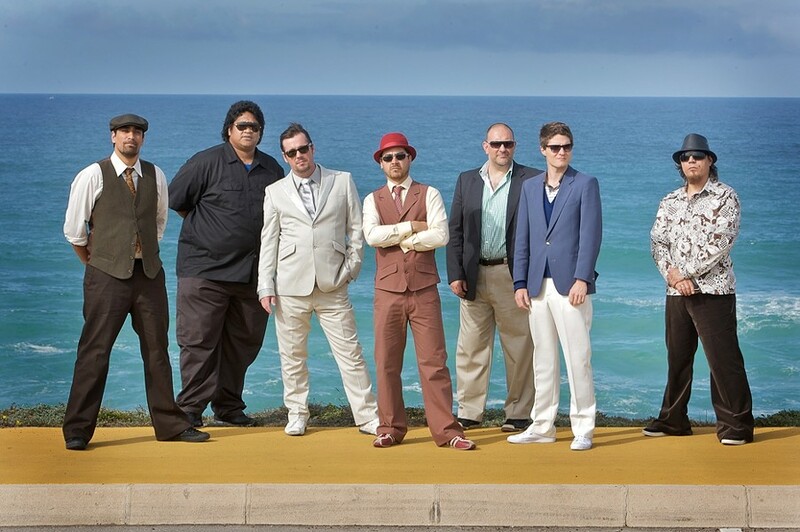 LIFE’S A BEACH: The 10th Anniversary Summer Solstice Reggae Festival begins on June 20 at Avila Beach Resort, featuring headliner Fat Freddy’s Drop. The 10th Anniversary Summer Solstice Reggae Festival begins this Sunday, June 20 at Avila Beach Resort! All I have to say is, holy crap, there’s a lot of music going on this weekend! This year’s line-up is dank and phat! Top Shelf, Still Time (hot off their four-month national tour), Alborisie, Dirty Heads, and Fat Freddy’s Drop are on the bill for this daylong event. Dirty Heads are on the top 10 Billboard College charts right now, and Fat Freddy is an awesome eight-piece dub and reggae act out of Wellington. Plus you’re at the beach. With beer! ‘Nuff said! Advance tickets are available at all VALLITIX outlets including Boo Boo Records in San Luis Obispo, the Mustang Ticket Office on the Cal Poly Campus, and at the Mid-State Fairgrounds Box Office in Paso Robles; on-line at www.vallitix.com or by phone at (888) 825-5484. Doors open at noon. THE DOGGFATHER! : Snoop Dog plays Pozo Saloon on June 20. Bring your dad! He’ll love it. Pozo Saloon is set to bust a move on some hip-hop action this Sunday, June 20 when rap superstar Snoop Dog is joined by Rebelution and Neighborhood Creep for a 3 p.m., all ages show. Buy tickets at pozosaloon.com. 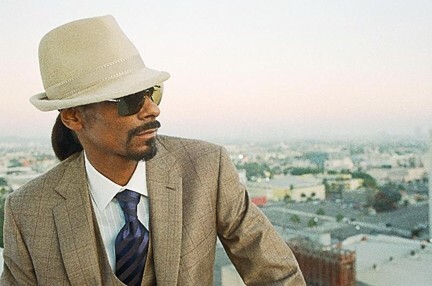 Snoop’s newest is Malice N Wonderland, the Doggfather’s tenth solo outing. YEE HAW! : On June 17, the Cambria Historical Society hosts an outdoor concert with singer-songwriter Juni Fisher at the Cambria Historical Museum. 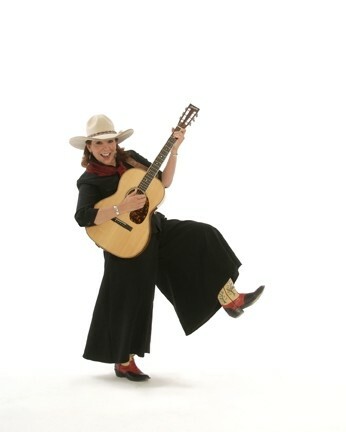 A cowgirl, mouthwatering barbecue, and a premiere historic Cambria exhibit collide this Thursday, June 17 when the Cambria Historical Society hosts an outdoor concert with singer-songwriter Juni Fisher at 7:30 p.m. in the Cambria Historical Museum ($20 donation). The evening at the museum begins with a Hearst Ranch barbecue at 5 p.m. and will highlight the opening of the museum’s new “Ranchers and Stewards” exhibit, featuring the historic Hearst Ranch of San Simeon and Fiscalini Ranch in Cambria. Barbecue and Hearst Ranch wines are offered at a nominal cost. Buy tickets at Cambria Chamber of Commerce, 927-3624; CHS Museum, 927-2891; ECR Gallery, 927-1369; or online at cambriahistoricalsociety.com. The Cal Poly Wind Ensemble will perform its “Home Concert” at the Cuesta College Cultural and Performing Arts Center at 7:30 p.m. Friday, June 18. This is a musical review of the program that will be presented at the Walt Disney Concert Hall in Los Angeles at 7:30 p.m. Tuesday, June 22. Tickets are $5 and available at the door. Jazz guitar great Mimi Fox gets The SLO County Jazz Federation and The SLO Museum of Art treatment this Friday, June 18, at 8 p.m. as part of the sixth consecutive monthly concert in the highly successful Marilyn Greenberg Jazz Series. The internationally renowned Fox has been named in six consecutive Downbeat Magazine International Critics’ Polls and has eight highly acclaimed albums as a leader. Tickets are $30, available at Boo Boo’s or The SLO Museum of Art. For more info, call 543-8562. You’d be hard-pressed to find a better party band than RollerCoaster, a high-energy retro and disco act with a theatrical twist. This is the sort of band whose energy is so infectious you leave your inhibitions on the dance floor. They’ve done corporate gigs, played Michael Jackson’s Neverland Ranch, Los Angeles Lakers games, Access Hollywood, and television appearances. See them Friday, June 18 at Mr. Rick’s. After a long tour chronicled relentlessly with inane and annoying blog entries inundating my email in-box, the all original rock, funk, reggae, hip-hop, bathrobe-clad trio known as Fish Out of Water have returned home to play two concerts at The Cliffs Resort in Shell Beach on Friday, June 18 (4 to 7 p.m.) and Saturday, June 19 (noon to 3 p.m.). Maybe now they can stop writing me, eh? This marks the band’s second national tour where they racked up 75,000 miles on the road. Bassist Pat Golliher, a SLO Town expatriate currently living in Santa Cruz, returns to his old stomping grounds this week to support another former SLO-Towner, Amee Chapman, an amazing singer-songwriter, on Friday, June 18 at Sweet Springs Saloon at 9 p.m. They’ll be joined by Western Swing Hall of Fame pedal steel player Dave Wren. On Saturday, June 19, they open for Truth About Seafood at the Sea Pines Lodge “Concerts on the Green” at 2 p.m. Celebrate Father’s Day with some great bluegrass when the Arroyo Grande Village Summer Concert Series continues on Sunday, June 20 with The Grass Less Traveled and openers Craig Kincaid & Friends, at 1 p.m. in the Rotary Bandstand in the historic Arroyo Grande Village. The Grass Less Traveled plays a mixture of traditional and contemporary bluegrass with a dash of country, mountain, and Irish music. At the Hamlet, this Sunday, June 20, the Famous Jazz Artist Concert Series continues with Charlie and Sandi Shoemake presenting an afternoon of the music of composer Jerome Kern. Bassist Fred Atwood, drummer Darrell Voss, and one of the Los Angeles jazz scene’s fast rising young talents, Nick Shoemake on trumpet (The Shoemakes grandson) will join the fun. One show only at 4 p.m. Tickets are $15; call 927-0567 for reservations. If dad isn’t into camping, hip hop, or reggae, you can always take him to an early dinner at the Clubhouse and enjoy the Father’s Day Rhythm & Blues Revue this Sunday, June 20, at 4 p.m. Hear the newly-expanded Dr. Danger Band! Check out Brad Kyle (guitar/vocals) and Ray Wells (harmonica/vocals). But that’s not all! Experience the soulful vocals of Linda Lucille with Brent Dannells on keyboard. Not enough? How about Joey Five & Dimes and the Moneymakers, and Lorenzo Pace on sax. There is no cover, but if you’re planning to eat, reservations are recommended: 548-8500. PUT A LITTLE SUGAR ON IT! : SugarBeat, an all-girl, guitar-playing, Nashville-based songwriting trio, hits the Steynberg Gallery on June 22 during the Songwriters at Play showcase. SugarBeat, an all-girl, guitar-playing, Nashville-based songwriting trio, hits the Steynberg Gallery this Tuesday, June 22 during the Songwriters at Play showcase beginning at 6:30 p.m. 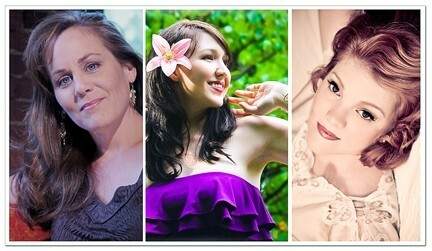 If you like sophisticated harmonies and hooky melodies sung by three sweet and sassy Nashville honeys, you know where to go! 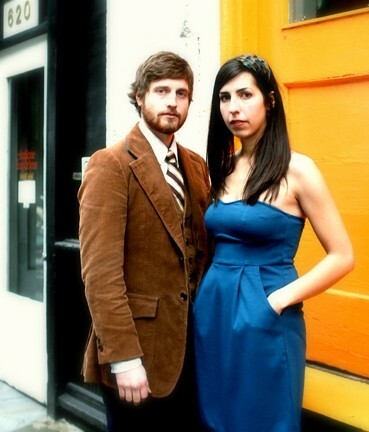 Seattle’s Ian McFeron and Alisa Milner play the Frog and Peach this Tuesday, June 22 at 8 p.m. during “Pint Night.” McFeron has big plans for 2010, setting out on an ambitious, 16,000 mile tour of the continental United States where he will perform more than 70 shows in less than 90 days, all while functioning as his own, independent record label, booking agency, and management company. “The music industry and the economy at large are facing a lot of challenges right now and there is a lot of speculation about when things are going to turn around, and what that will look like,” he said. “It’s left a lot of people in limbo, wondering which way to go. I figure that’s a good time for musicians to get back to basics and do what they’ve always done: travel the nation, inspire listeners, and build community.” He’ll be joined by his long-time musical partner Alisa Milner, a Texas-style fiddler, cellist, and harmony vocalist.